A day after the defeat in the Hamirpur byelection Chief Minister Virbhadra Singh today took rebel party leader Vijay Mankotia head-on, daring him to carry out his threat and come out with whatever damning evidence he had to expose him. Major Vijay Singh Mankotia has stepped up his tirade against Virbhadra Singh by seeking intervention of the President for removing him from the office of the Chief Minister. He said he would approach Lok Sabha speaker Somnath Chatterjee shortly to demand action against CM’s wife Pratibha Singh, a Lok Sabha member from the Mandi constituency. After covering each village in six panchayats in Dharampur block during the "sankalap padyatra", over 200 Seva Dal padyatris converged on Dharampur town and burnt an effigy of suspended Shapur MLA Mankotia to express their ire against the "fabricated" audio CD. Monsoon’s northwards movement has triggered a climatic change in the Sutlej valley. The climate change in turn has increased the geo-hazards like flash floods, cloudbursts and landslides, threatening power projects, labour colonies and villagers living downstream along National Highway -22 that runs along the Sutlej, scientists said. In the absence of allocation of funds, the HP Public Works Department has failed to take up repair and resurfacing of roads before the onset of monsoon in the state this year. An incident of assault on Rajgarh deputy superintendent of police (DSP) Bhagmal Thakur by a drunken man was reported from Rajgarh, about 120 km from here, yesterday. Rahul (3) and Shivam (1) were burnt to death when the jhuggi they were sleeping in caught fire around 10.30 this morning at Swaraj Majra village near Baddi. 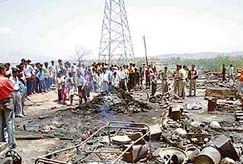 The mishap occurred when around 50 jhuggis located there caught fire. A view of the jhuggis burnt down in a fire at Swaraj Majra, near Baddi, on Wednesday. Salim (14) was brutally murdered with a sharp-edged weapon in sleep at his house in Harraipur village, near Baddi, last night. While Salim was sleeping alone in a room, his two sisters and parents were sleeping in the courtyard. Inconsolable members of the family of Salim (inset) who was brutally stabbed to death at a village near Baddi on Tuesday night. Security officials at the office of the Prime Minister of the Tibetan government-in-exile ere were caught unawares when a blast took place in a house adjoining their office, leaving two old women injured. Twentytwo passengers were injured, three of them seriously, when a private bus coming from Dehra hit another bus from the rear outside Govt. Senior Secondary School, Dhaulatpur, 10 km from here, on the Matour-Shimla national highway this morning in a bid to pick up more passengers, the police said here today. The police has arrested Rajinder, alias Jindu of Sakri village, who had fled after allegedly killing 12-year-old boy Aditya of the same village on May 28. The accused was arrested from Shahpur forest on Monday night. The accused had allegedly murdered the boy during play by attacking him with a sickle. A labourer was killed and another seriously injured when a pillar gave way at a building that is under construction in Sector 4, here this evening. Mohan Sauf (25), from Uttar Pradesh, died on the spot. Ashok Kumar, who also belongs to UP, was rushed to ESI Hospital with multiple injuries. He was later taken to the PGI, Chandigarh. The police arrested seven thieves yesterday and recovered a laptop and mobile phones allegedly stolen from Manali. One person was killed and three were seriously injured when a huge rock slid down a mountain slope and hit them near Saach Pass, situated at an altitude of 4,390 m, official sources said today. The government has decided to set up a national illness assistance fund in partnership with the Centre to help provide better healthcare facilities to the vulnerable sections of society. The Himachal Government today cleared the detailed project report (DPR) of the controversial $ 350 million ski village project. The state Cabinet considered the DPR along with the reply to queries pertaining to environmental issues submitted by the Himalayan Ski Village company which is setting up the project. Addressing a press conference here today he said Mankotia could harm him the way he liked but he should not have damaged the party. He said he was prepared to face the consequences of Mankotia’s actions but he was concerned about the damage he was causing to the party at the behest of former Chief Minister P.K.Dhumal. He deliberately released the audio CD on the eve of the byelection to damage the party. He played the game of Dhumal who had been looking for a convenient person to get the CD released. Dhumal himself was a timid person and did not have the courage to release the CD. No one else in the BJP was ready to release it. This was evident from the fact that the BJP started playing the audio CD in Bilaspur, Hamirpur and Una within minutes after it was released in Dharamsala. If Mankotia had party interest in mind he could have waited till June 2 , the polling day, before going public with the CD. The fact was that he was hand-in-glove with Dhumal and he had released the CD only to harm the electoral prospects of the Congress in the by-election. He had stabbed the party in the back. He asserted that the Hamirpur defeat would not have any impact either on his government or the party. The BJP exploited the sentiments of the people by raising the bogey of regionalism and casteism for electoral gains which was not in the larger interest of the state as it weakened emotional integrity. He conceded that the audio CD had harmed the party. Virbhadra Singh said he had received the resignation of Forest Minister Ram Lal Thakur, who resigned on moral grounds after losing the byelection. He had not spoken to him as yet and he would take a decision only after meeting Thakur. Personally, he was of the view that there was no reason for submitting resignation as it was not his individual defeat. Replying to a question he said it was time to restructure the Council of Ministers as wanted to put senior party leaders in responsible positions. He provided mediapersons with copies of the letter addressed to President A.P.J. Abdul Kalam. He said from the telephonic conversation recorded in the CD, it appeared that the “monetary transaction racket” was going on for quite some time. Seeking a high-level probe into the conversations in the CD, he has asked the President to ensure a separate probe into the property and landholding of the Chief Minister. Contrary to a popular perception, the landslides are not “new demons of death” along the Sutlej, but some of them date back to over 45,000-50,000 years, a study presented at the national workshop on geo-hazards that concluded here revealed. Talking to The Tribune on the sidelines of the workshop, Dr Rajiv Gupta, scientist, Wadia Institute of Himalayan Geology, Dehra Dun, said, “The upper Kinnaur and Sangla valley are now experiencing wet climate as monsoons have moved northwards. This movement has registered climatic change in the Sutlej valley, increasing the risk of geo-hazards downstream. Dr Gupta, who has studied the landslides hazards in the Sutlej valley for the past 15 years said as many as 12 labour colonies and 15 villages more particularly, Skiba, Peo, Kadra and others located on National Highway-22 in Kinnaur district ran the risk of landslides as there were located on “loose soil” and needed to be evacuated. Landslides were not new to the valleys. Over 12 past landslide sites have been found in the valley. Study has come out with a prescription to halt the geo-hazards that have cost the state exchequer Rs 10 billion between a period from 2000 and 2005. “If the PWD, national highway authorities and local builders put a proper drainage system along the roads and the highway, 50 per cent of the landslides would be solved. Secondly, upper catchments need treatment to arrest the risk of geo-hazards and high silt-content in the rivers”, he said. Dr Gupta observed that cloud bursts strike the v-shaped closed small valleys, including Sangla valley more frequently. The Sangla valley has experienced a spurt in hazardous construction and hydro power project that in turn has made it vulnerable to landslides and flashfloods in the Tong Tong Che and other streams that feed the river Baspa, he added. Falling of rocks has become common in the upper Sutlej valley that in turn triggers landslides, more particularly in the Bharat and Tinku nallas in the Namgai region. The rock and boulders falls from steep parallel mountains in the Sutlej valley in the Kinnaur block which results in floods and increased silt content. He said the monsoons would rarely reach upper Kinnaur, now it had been found in the Pooh subdivision in the semi-cold desert. “The Moorang has become more susceptible to landslides as the rains act as a trigger factor in the loose strata in the region”, he said. Earlier, there was a regular practice in the Public Works Department to complete all resurfacing of roads in summers and adequate funds were released by the government. But this year, the secretary of HP PWD has centralised all funds at Shimla and superintending Engineers in the state are debarred from releasing funds for the maintenance and resurfacing of state and district roads resulting in complete suspension of resurfacing and maintenance works. Enquiries revealed that the state government had created a new agency known as HP Roads Infrastructure Development Corporation which would release funds for the maintenance and repairs of all state and district roads. All executive engineers had been directed by the government not to spend any fund on the maintenance of state and district roads without the financial approval of the HPRIDC and submit the entire estimate to the corporation. Hundreds of such estimates sent by the executive engineers all over the state were piling up with the corporation at Shimla resulting in suspension of all development activities in the state. Many executive engineers have been eagerly waiting for the release of funds but all in vain. A senior officer of the PWD said the tiring season of roads in the state was almost over and the department could not take up the resurfacing of roads in the absence of financial approval from the corporation. He said besides, state and district highways also needed major repairs before the onset of monsoon. After September 2006, the PWD had not taken repair and maintenance of those roads which were damaged by the flash floods in the last rainy season in the state for want of funds. The PWD was expecting that the government would provide funds for the same, as the PWD was getting a special budget for this purpose in the past. Last evening, when Thakur was on the way home in his car from the Rajgarh market, a drunken man reportedly misbehaved with him near Rajgarh telephone exchange. It was alleged that the car of the DSP had touched pedestrian Ranbir Thakur, a resident of Lana village, who was under the influence of liquor. Ranbir Thakur allegedly misbehaved with the DSP and tried to pull him out of his car and tried beat him up. But the DSP reportedly retaliated and thrashed him in return. Ranbir Thakur was taken to the police station. But the trouble started only when the police took him to a hospital for a medical checkup after a case was registered against him. Residents turned up in large numbers on the hospital compound and raised slogans against the DSP and demanded registeration of a case against the DSP, too. When the administration noticed the seriousness of the situation, which was reportedly going out of control, Rajgarh SDM Vivek Chandel came to the spot and persuaded the people to withdraw their agitation on grounds agreed between both parties. Maya, mother of the deceased children, had gone to the market and the children were alone in the jhuggi when the mishap occurred. She tried to reach out to her jhuggi to rescue her children, but in vain. Fire engines were requisitioned from Baddi. Fast-blowing wind helped the fire to spread rapidly. One jhuggi had to be removed to stop the spread of fire. The cause of fire could not be ascertained immediately. The jhuggis belonged to migrant labourers from Bihar and Uttar Pradesh. A majority of them lost cash that they had earned over the past several months. Currency notes of around Rs 38,000 belonging to Suraj Mal were burnt. SDM Manmohan Singh extended a relief of Rs 5,000 to the family of the deceased children, while the DC gave Rs 15,000 to the family. The murder was noticed by tenant Rattan Lal around 5:30 a.m. this morning when he came down from the terrace to put his bedding in the room. Rattan Lal was terrified to see the blood-stained body of Salim lying on the bed. He immediately called the parents of the slain child who were preparing morning tea in the kitchen. The child was rushed to a Nalagarh hospital where the doctors declared him brought dead. SHO Gurdyal Chowdhary, who visited the spot, said as per preliminary information given by father Dildaar Singh, an old helper employed in their welding shop, Shamshad Mohammed, nursed a grudge against the family. 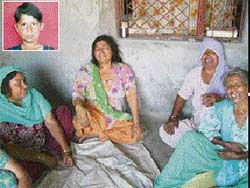 Mother Anwari told mediapersons that Shamshad was responsible for the murder of her son. As per police information Shamshad, who hails from Bihar, was suspected of having stolen about Rs 12,000 from their house after which he left for his native village. He had later asked them to hand over his belongings to his brother who worked at Barotiwala. Dildaar’s family had, however, insisted that he should come himself for his belongings.. When he came Shamshad was beaten up and was asked to return the money. The family also refused to hand him back his belongings till he returned the money. This had angered Shamshad who had then gone away, saying that he would settle scores with the family. The house close to the office of the PM belongs to Kalsan Tsering, an employee of the Tibetan government-in-exile. However, Tsering was not present in the house when the blast took place. Yang Thang (72) was there in the house with her friend, Sonam (80), when the blast took place around 1.30 am today. They both got minor injuries in the blast. The district police has called forensic experts from Shimla. However, preliminary investigations indicated that leakage from an LPG cylinder in the house triggered the blast. The walls of the house developed cracks while the ceiling of the kitchen was partially blown off. "We believe that an electric spark acted as the necessary catalyst to trigger the blast", said Kangra SP Ajay Yadav. Later, a meeting of senior police officers with officials of the Tibetan government-in-exile was held here to review security of the Dalai Lama and PM Samdoh Rinpoche. Those seriously injured were shifted to Dr. R.P.Govt. 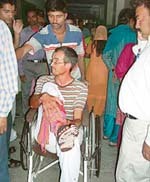 Medical College Hospital, Dharamsala, while eight of the injured were discharged after first aid at the local hospital. Unfortunately, there was no power supply in the hospital, adding to the woes of the injured passengers. S.B.Sood, SMO, Civil Hospital, said as the hospital did not have any generator X-ray examination of the patients, who had suffered fractures, could not be done. Though the hospital had the invertor facility it was needed to run the operation theater. The town had been without power supply since 7.A.M and it was only after local MLA Surender Kaku visited the hospital that the HPSEB authorities restored the power supply. The police has arrested bus driver Kapil Dev, who hit the other bus from the rear. According to DSP K.C. Shandil, a case has been registered. He said the culprit had been hiding in forests in Kangra district. “Yesterday, when the accused met a shepherd in a forest under the Shahpur police jurisdiction and revealed the cause of his hiding there, the shepherd informed a photographer at Shahpur town, who further informed the police,” he said. Meanwhile, the accused was produced in a local court this afternoon that remanded him in police custody for 10 day. Both the labourers were removing the earth surrounding the pillar at the construction site of the private building. The pillar base thus got weakened and collapsed. The other labourers who were working nearby rushed to the site and pulled them out. Mohan’s body has sent for postmortem. The police has registered a case against the land owner. Mandi SP M. Chander Sekhar said the police stopped a taxi (HP 01 M 3984) and recovered a laptop and mobile phones from its seven occupants during a search. They had been remanded in police custody for 14 days. Four other pedestrians had a narrow escape in the incident. The deceased was later identified as Mahatma Chand, a resident of Pangi valley, sources said. This decision was taken by the Cabinet here today. The state government will contribute Rs 2 crore and the Centre Rs 1 crore. The company has been given one month’s time for submitting the environment management plan (EMP). As many as 670 hotel rooms and 132 chalets are proposed to be constructed n the first phase of the project.